And they are two interesting musicians. Besides being an accomplished violinist in a whole range of genres from improv to indie rock to baroque to modern, Huizinga was a founding member of the international network Classical Revolution — an organization of musicians dedicated to performing high-quality chamber music in non-traditional settings — begun in San Francisco in 2006. Fournier is organist and music director at St. Vincent de Paul, a specialist in Gregorian chant, a well-known recitalist on harpsichord and organ who has been called one of the finest organists of his generation. You’ll find them in three coffee houses on these dates: May 6: Baluchon (Sorauren Ave.); May 7: The Common (College and Dufferin); May 8: Sam James (Harbord and Clinton). It all culminates in a concert of Bach at Holy Family Church on May 18, where hopefully some of the audience will have had the pleasure of first hearing them over a latte. There’s a different tour you can take this month, one which centres on the theme you could call aspects of the feminine nature. On May 24, 25 and 26, women of talent and vision are celebrated in the Toronto Consort’s “A Woman’s Life,” created by Alison Mackay. She is the designer of such multi-disciplinary shows as “The Galileo Project,” House of Dreams” and “The Four Seasons, a Cycle of the Sun,” each one incorporating stunning imagery, movement and gorgeous music to allow the audience to bear witness to a culture vividly brought to life. In the present production, she explores the lives and accomplishments of women composers and singers from the Middle Ages, Renaissance and early Baroque — women such as Hildegard of Bingen, Barbara Strozzi and Francesca Caccini. The Consort is joined by guests, actors Maggie Huculak and Karen Woolridge. Aspects of Venus, even her ablutions apparently, are explored by soprano Dawn Bailey and the Elixir Baroque Ensemble, in TEMC’s last concert of the season on May 26. Bailey is surely one to watch; her extensive résumé includes art song, oratorio and operatic appearances in Canada and abroad, in new music and old. She’s especially sought after for her interpretations of music from the 17th and 18th centuries. In this concert she and the Elixir Ensemble perform music of the French Baroque, including a cantata by Colin de Blamont, La Toilette de Venus. And finally, on May 27 the Toronto Continuo Collective presents “The Immortal Soul of Psyche.” An astoundingly beautiful mortal woman, Psyche had to overcome impossible obstacles in order to win her lover, the god Eros; through perseverence she was rewarded with immortality and everlasting happiness. Works by Locke and Lully unfold her story, performed by singers, guest instrumentalists and the Continuo Collective themselves, a group dedicated to the study of the art of expressive continuo playing. May 10: Michael Kelly was an Irish tenor, composer, actor and theatrical manager whose career led him to artistic centres all over Europe; along the way he met and made friends with many of the most celebrated musicians of the day. Not the least of these friendships was with Mozart, whom he met in Vienna. In Kelly’s memoir Reminiscences he describes an evening’s entertainment he attended, a quartet party where the performers were Haydn, Dittersdorf, Vanhal and Mozart — it must have been quite an event! In “An Evening with Michael Kelly,” the Eybler Quartet recreates the music heard that evening while their guest, actor R.H. Thomson reads from Kelly’s memoir and other writings. Gallery Players of Niagara present the same program May 12 in St. Catharines. May 11: The Peterborough Singers directed by Sidney Birrell is a 100-voice choir which celebrates the conclusion of their 20th season in their hometown of Peterborough with the performance of a masterpiece, Bach’s B Minor Mass. Soloists include soprano Leslie Fagan, mezzo Laura Pudwell, tenor Adam Bishop and baritone Peter McGillivray. May 25: Who else but I FURIOSI Baroque Ensemble would present a program titled “HIGH”? The plot is best described by themselves: “I FURIOSI rises from the depths and soars to new heights in this program of lofty heavens. Baroque gods always descended in a machine — but whence? Since those gods always returned up high, the ensemble endeavours to find out what all the fuss is about up there.” Guest for this concert, which takes place at St. Mary Magdalene Church, is lutenist and theorbist Lucas Harris. May 30, 31, June 1 and 2: You shouldn’t be surprised to find 19th-century repertoire on Tafelmusik’s upcoming program (namely, Beethoven’s Fourth Symphony, the Coriolan and Egmont Overtures, and Chopin’s Second Piano Concerto) — after all, they’ve been pushing the boundaries of their repertoire for some years now; also, they have as their next soloist the wonderful Polish-Canadian pianist Janina Fialkowska, a Chopin specialist, playing an 1848 Pleyel piano — the same model as that used by Chopin when he gave his last concert at the Salle Pleyel in Paris in 1848, and one of very few to survive. June 2: In a concert titled “Master Works of J.S. Bach,” organist Philip Fournier (of the coffee house duo above) plays three great works: Bach’s Prelude and Fugue in G, several fugues from the Art of Fugue, and the C Minor Passacaglia, on the Gober/Kney tracker organ at The Oratory, Holy Family Church. Simone Desilets is a long-time contributor to The WholeNote in several capacities who plays the viola da gamba. 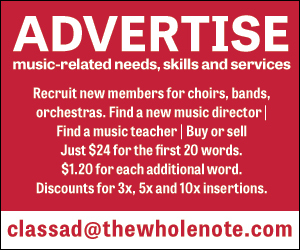 She can be contacted at earlymusic@thewholenote.com.